I know you must be thinking that this is one of those regular posts which would give tips about resumes. But trust me, this post will give you valuable insight into providing an edge to your resume. In my opinion, making the perfect pitch to the recruiters has become similar to solving a jigsaw puzzle. Unless you match the pieces correctly, you won’t be able to complete the puzzle. You could try to fit in a somewhat similar piece, but it won’t serve the purpose. This is exactly the case with job search these days. Job seekers today have understood the importance of customizing their resumes and it is not only for standing out from the crowd, but also to instil confidence in the recruiters that you are the best candidate for the job position. You need to ensure that your resume matches the profile that is being offered. This is the reason behind customizing the resume for every application (without resorting to false information) as you need to make minor modifications to ensure that the important things are highlighted prominently. 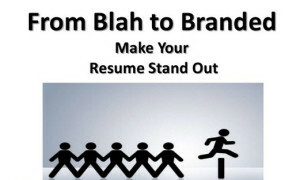 Here are 4 tips that should help you in branding your resume effectively. The job title needs to be in tandem with the job position that you are applying for. It would be even better if the targeted job title can be marked in bold letters so that is prominently visible. Make sure that the title is changed before sending in your resume along with your application, so that it maintains relevance with the job position being applied to. You should ensure that relevant information (in the entire resume) is arranged in a manner which highlights relevant information. However, the emphasis here is to modify the contents of the “summary” section such that any information, which may be directly or remotely related to the job profile, is presented in descending order of importance. A recruiter checks the summary first and then moves on to the other sections. So you need to make a powerful impact within this limited window of opportunity. Due to the extensive integration of technology in recruitment and selection processes, it has become crucial for resumes to contain specific keywords which would highlight them in ATS (applicant tracking software). But the role of keywords doesn’t end there. They are also useful to grab the attention of the recruiter during manual reviewing of the application document(s). So make sure that you place relevant keywords and core attributes at the top of the “skills” section as it would help in making a good impact on the recruiter. The achievements section needs to be re-checked with the initial words in the statement comprising critical and relevant information. There is a fair possibility that the resume would be screened initially by a low level HR representative, so it is important to grab his / her attention in the first few words itself. It is also advised that the number of achievements should be limited to 2 or 3 with only the most significant and major achievements being mentioned. This does not mean that you do not have other achievements. Remember, this is a resume and not a CV. So be brief and concise. If you are uncertain about the changes and the ways in which they have to be done, then seek professional help from professional resume writing services. You could also make your resume online with so many online resume generators available today. But nothing beats the personal touch provided by resume writing services where you get the benefit of an in-depth consultation from experts and you get your resume redesigned and targeted by some of the best writers in the industry. Previous Post5 Employees That Bosses Absolutely DetestNext PostCan You Lie On Your Resume and Get Away With It?